Engineering being a major component in piping industry, will consist of Front End Engineering Design (FEED), Detailed Engineering and Computer Aided Engineering (CAE). FEED is the first and one of the most critical steps in the project when it comes to Engineering. Any project involves the quotation and bidding process from the vendor to the customer. Through FEED, the technical bid is prepared and submitted along with the commercial bid to the customer. FEED will mainly include analysis of the RFQ (Request for Quotation), arriving at what has to be offered or also offering any alternative solution. After the FEED, once the order is got we move on to the Detailed Engineering Stage. Here the offering is re-evaluated for compliance with the requirement, any change in requirement from the customer is suitably incorporated. Also based on the final offering, other aspects which are necessary for furthers stages in the project are determined (for example – oil volume, maximum crane capacity to lift the pipes, any additional items that is required for installation. CAE is done in case there is a special requirement from the customer. 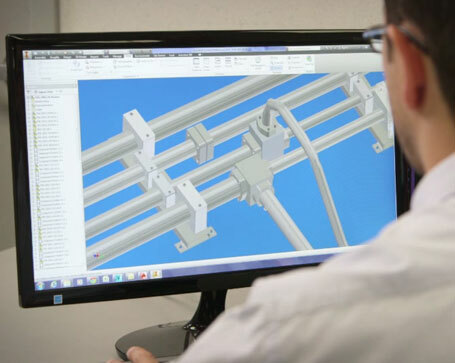 CAE like Pipe Stress Analysis, Finite Element Analysis (FEA), Computational Fluid Dynamics (CFD) are performed. Design involves creation and approval of General Arrangement Drawings (GA), 3D Models, Piping and Instrumentation Diagram (P&ID). All these drawings are done through state of the art CAD software. In a typical project, the customer is asked for Equipment Layout Drawings, Civil Layout Drawings, Schematic Drawings if available. Based on the input our installation team visits the customer site to verify the drawings supplied by the customer. Once verified the piping drawings is issued and sent to the customer for approval, after the approval the factory proceed to fabricate the piping system. GA Drawings comprises of all details like section views and all the items bear tag numbers which can be referred to in the BOM list.